A homeschool unit study is a great way for boys to learn and we plan to have a lot of them here on Brain Power Boy because they are a powerful tool for boys’ learning. Keep in mind that a homeschool unit study is not just for homeschoolers! Anyone can use these to help their boys learn about a topic and I highly suggest you try one! Here on Brain Power Boy we love unit studies. We put a lot of research into our unit study resource lists. We do all the searching so you end up with a great unit study on each topic covered. What is great about our units is that they are fun, they are educational and they are all are geared toward boys. What is a Homeschool Unit Study? A unit study is a fancy way to say that you study a subject or topic and learn all about it. Have you ever been curious about something and wanted to learn all about it? Maybe it was a hobby or a topic related to your home business. Or, maybe you wanted to know everything there was to know about homeschooling and you dove in, talked to people, read books and articles online, went to some meetings, attended a homeschool conference and so forth. That is exactly what a unit study is like. It is a deep dive into a topic of interest. People do it all the time but they often don’t think of it as a unit study. Units can be formal in that it is well-planned out and covers every subject. Some people even buy unit studies to make sure that they are covering every subject within one unit. That is not the way we have done them and I will tell you why. I am a big proponent of child-led learning and learning through play and because of that, I want my son to be interested in the topic and because he is interested he will want to dig in to learn more. When I do things that way the learning increases exponentially and he also remembers what he has learned. On another note, it is not only about the learning on that specific topic, but about how to learn about topics in general. I want him to understand how to find what he wants to know. I want him to know the best places to go for information, how to reach out to people who may have information he needs and may be interested in helping him learn more. I want him to know the ways he can take all of that information and put it into a cohesive experience so he gets the most out of it. I hope that is what you would want for your boys as well. It will serve them well throughout their lives. Here on this site, we focus our unit studies on topics that boys traditionally like. One of the things I really enjoy doing is finding resources. I guess that is a bit of a quirky hobby of sorts. I search long and hard for the very best resources out there in order to create excellent, high quality, homeschool unit studies that will engage boys and hold their interest. 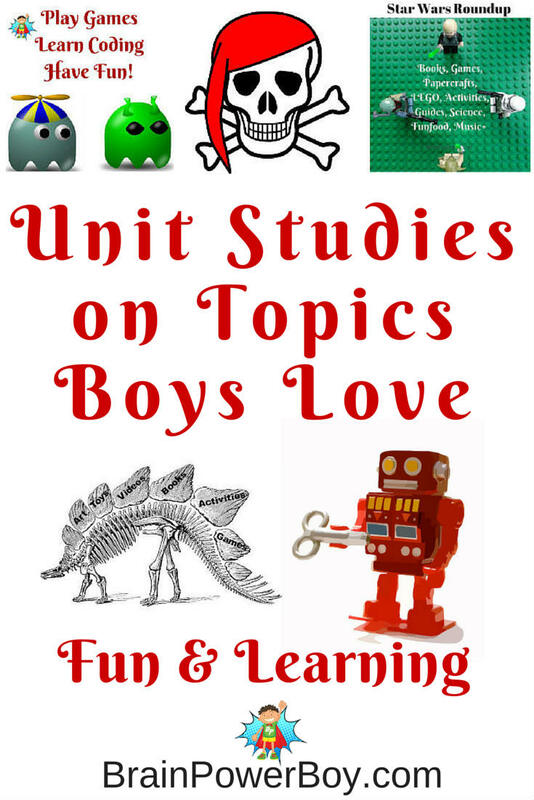 Unit studies are perfect for finding a lot of info on one topic and this is the perfect place to find a homeschool unit study for boys. Many boys get into a topic and you can’t find enough information to satisfy them! I remember going through all the books in the library about pirates and then using Inter-Library Loan and then finding more on the Internet, and finding games and maps and so on . . . It took a long time for my son to be satisfied that he knew enough about pirates and then he was done–and he moved on to the next topic. I suggest starting with a topic your boy is interested in. Then moving on from there. Our Leonardo da Vinci Unit Study covers this fascinating Renaissance man. We have games, art, hands-on activities and more. Star Wars May the 4th Be With You Unit Study – We had to do this one! We are big Star Wars fans and digging into the world of Star Wars was so much fun. You would be surprised at how much learning can go on when studying a topic such as this. I know you wouldn’t think that to be true, but just go take a look! These Star Wars Learning Activities include paper crafts, language, math, science, and more. There are both free and purchased options available. Boys love dinosaurs. I have found this to be true again and again. With Dig This Dinosaur Fossils Unit Study we share the very best unit study ideas surrounding dinosaur fossils. So interesting! Are you familiar with Rube Goldberg Machines? They are an incredible way to learn. Simply incredible. Play and Learn with Rube Goldberg Machines Unit Study We have a lot to offer here and hope you will enjoy them as much as we have. Boys interested in video games? I’m going to guess that in most cases I will get a yes! to that question. If so, why not try this Make Your Own Video Games post. It switches things up from just having them sit around playing game to having them create their very own video game. Cool, right?! Our homeschool unit study on Pirates has grown so much I had to move it to its own page. Pirates is one of the things we have studied the most over the years so this one is very detailed and covers a lot of ground. Go check it out. There are units on pirate games, pirate ships, pirate books, weapons, navigation and maps, pirate flags and much more. Your pirate fan will not be disappointed! Coding is a lot of fun to learn and there are many, many ways to go about doing so. We rounded up over 50 different coding resources and they are all broken down into different categories so you an easily find what you are looking for. From beginner to advanced coding and everything in between is covered in depth. I knew we had a lot of robot information on our site. After gathering it all together, I was surprised to see just how much! I have gathered together some Videos on How to Make a Robot. This is totally do-able as these are all easy to make robots. Do this. Your boys will really like it. Here is a Robot Memory Game if you have younger kids and want to get them involved as well. Here are some fun Robot LEGO Designs and the reason I am including it here is that you can research the look of different types of robots and then try to make them in LEGO. Not only do you learn about robots but you also learn design. Be sure to grab these to read during your studies They are the best Non-Fiction Robot Books for Boys. Sometimes it is also fun to compare what is written in Fiction Robot Books for Boys with what you have already learned. Can robots really talk? Do they look like that? and so forth. I hope you find a lot of valuable information on this homeschool unit study resources page. Keep checking back as we will add new topics when we can. You can also pin it for later. Signing up for our e-mail newsletters will ensure that you get all of the great boys’ learning resources and unit studies we post delivered right to your inbox. Just fill out this quick little form today!